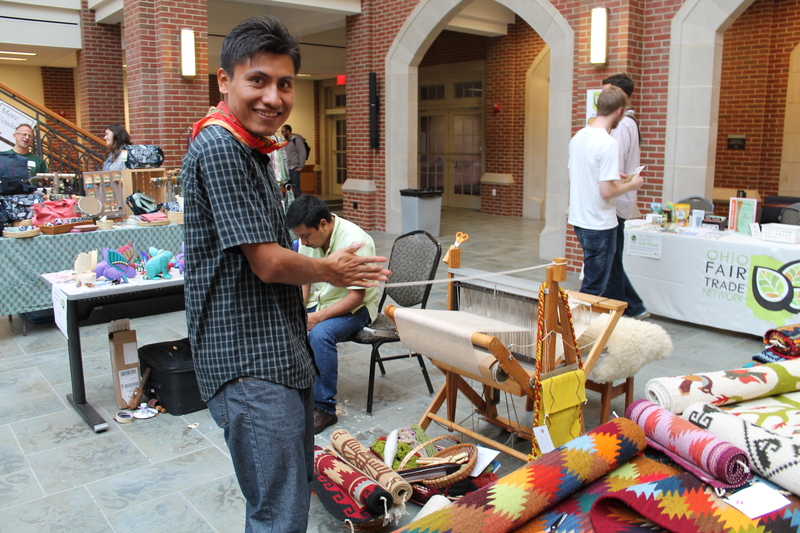 The link below will take you to information about the upcoming Ohio Fair Trade Expo that is being held at JCU on October 1, 2016. Marcos Bautista will be there showing and selling his works. 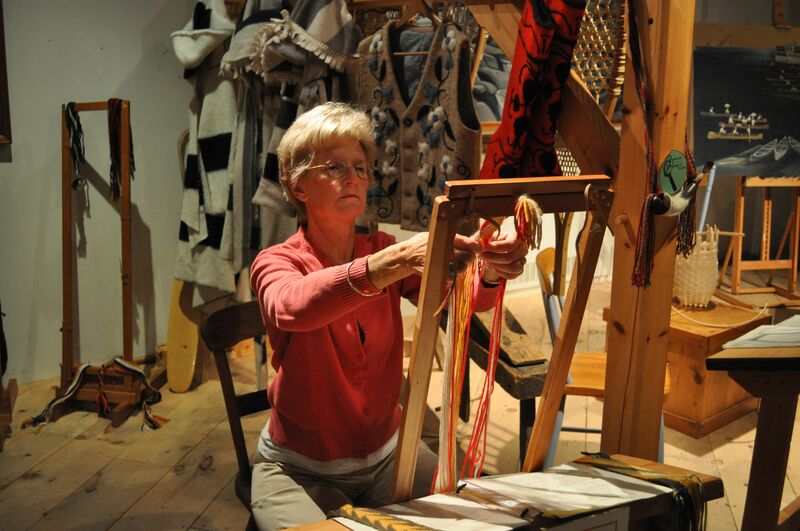 Come and support Debbie and continue being inspired by her artistic growth and weaving imagery. Three artists with unique methods of combining materials converge at Beachwood Community Center Gallery. Deborah Silver is a fiber artist whose weavings combine her interest in tribal imagery with contemporary faces. Her work is inspired by the increased cross-cultural nature of our world, with an emphasis on our collective history. The paintings of Cindy I. Smith evoke rhythm, pattern and process with special emphasis on texture and surface treatments. Cindy enjoys the uncertainty and budding discovery resulting from her blends of permanent inks with acrylics on canvas, panel board, wood and paper. Her color choices, frequent use of the squeegee and her top layer line work create organic, path-like patterns on textured surfaces that ultimately pull the viewer into her works. Steven J. Simmons specializes in flowing abstractions and three-dimensional works. Steve’s boldly colored works reflect his child-like fascinations with surfing, water, wind, the cosmos and nature. Deep, electric blues and crashing waves are common motifs. The request came in through the website; a commission was being offered. 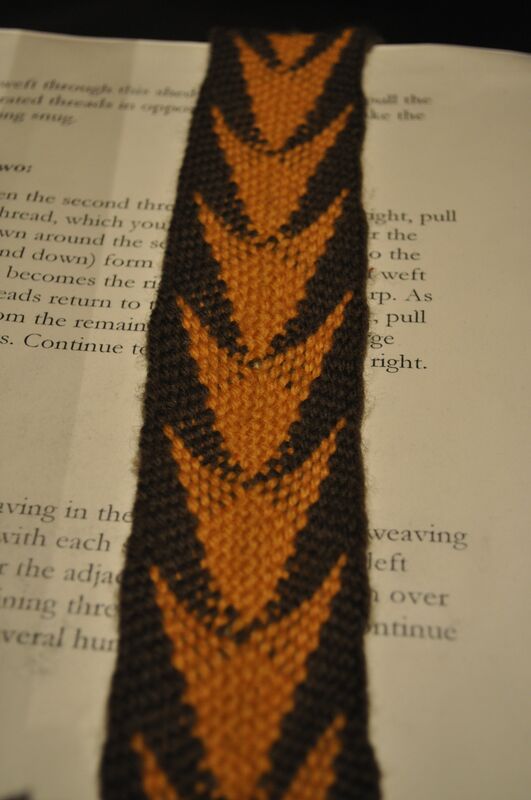 A weaver was needed to make an inkle belt. 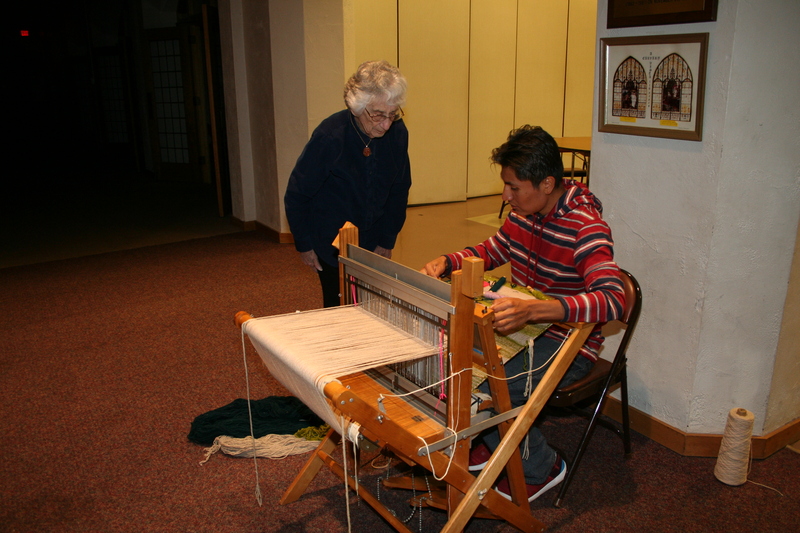 Few of us must weave for money, and an inkle would never create enough income for the idea to entice most of our members. Eyes quickly glazed and looked away at the mere thought. Then our web mistress sent the message directly to me. It seemed this person was persistent in her quest and had asked please again. 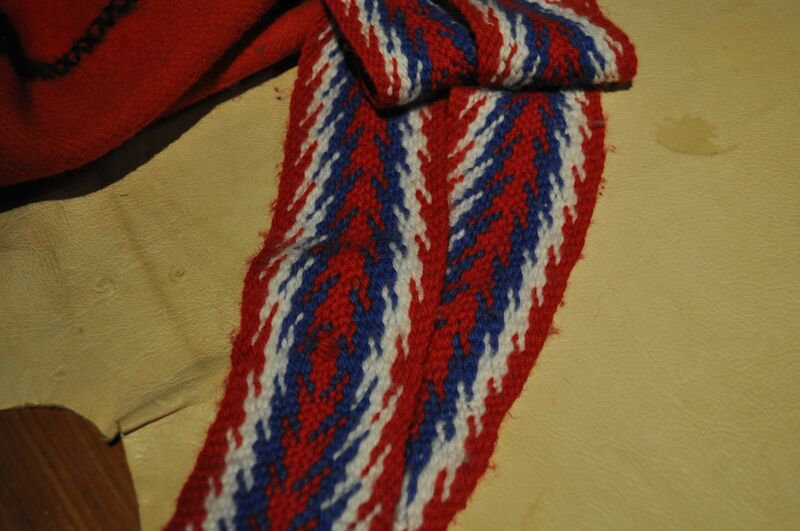 She was going to the Artic for three weeks in February and wanted an inkle belt to wear while there. In an effort to let her down gently, and maybe get a little bit of a story, I contacted her and asked her exactly what she wanted. She told me she had already bought a belt but was disappointed by it. She assumed I would find her odd when she explained that it would do, but it was the wrong red. It was not the red she wanted to see cutting through the great white Arctic expanses and would clash with the rest of her ensemble. She was working diligently to make her anorak (an eskimo windbreaker) and moose hide mittens; wisely leaving her necessary footwear to the professional mukluk makers. 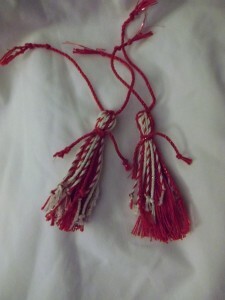 She still had more than a month to find a weaver to create her bright red belt of her dreams. She had to try. 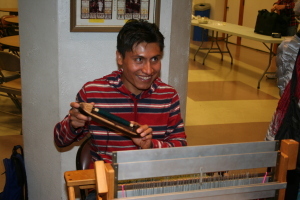 I have many inkle looms. The world of weaving hardly gets simpler. I have many red yarns; only needing to make a choice in material, diameter and hue. She’s a neighbor, only living a mile from me. She seemed weird enough to be a weaver, so I felt compelled to help. I offered to set up the loom and show her how to weave it herself with a little coaching. She loved the idea, and we agreed to meet. The next day I took a few books and one of my little inkles and went to see and show. The blue and white demo warp had been worked by many hands large and small over the years, but she still saw the beauty of the structure despite the obvious tension changes. She fingered the cloth and said she thought it was neat, but really wasn’t anything like the belt she bought. She brought out what she had, and she was right. I was showing her an inkle. She was holding a ceinture fléchée. It wasn’t even a pretty ceinture fléchée; machine made from chunky poly yarns in uninspiring colors. It was a big thick French Canadian belt 6 feet long, 5 inches wide, and a structure so stiff you could beat back a bear with it. Trappers wore them wrapped twice around the waist. They could use them as utility belts and back braces when heavy loads required more lumbar support than usual. Cinched tightly enough, even I might be able to move a moose, but that particular belt was unattractive enough that I wouldn’t have wanted to wear it even in the Arctic. She brought out a book to show me her inspiration photo. The front cover showed a woman happily dragging a sled across the frozen tundra. A bright red belt circled her waist, and that photo was laid over a much closer view of the belt. 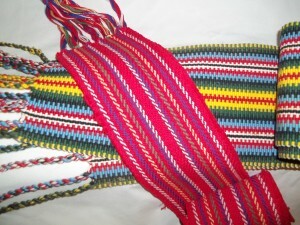 It was a beautiful Pendleton red Metis ceinture fléchée, stunning enough to inspire, and worthy of wear anywhere. I completely understood and wanted to help, so we had to quickly move to a plan B. It turns out that my personal textile collection contains two ceinture fléchées, one of which is a beautiful Pendleton red Metis. They both came through Bertie, so I have no real knowledge of their history or monetary value. None of that has ever mattered to me as I consider them all priceless and have no desire to sell off a single stitch. I was willing to rent the belt to her on the condition that she return it with the story when she came back and thawed out, but we both had concerns over its eventual condition after three weeks in the Arctic. When I found her one she could buy and keep forever, we settled into the perfect plan C. A Canadian company named Etchiboy has a website where you can pick from many beautiful ceinture fléchées. She ordered a stunning red and white belt for about the same price I would have charged her to rent mine. I get to keep my ceinture fléchées safe and warm, and she has her total, completely coordinated, eskimo suit; stylishly worn on her intrepid Arctic adventure to keep together forever. It turned out that what she thought she wanted wasn’t what she thought, but what she really wanted she eventually got. We did decide to make up a few matching tassels to sew on her mukluks (the lady on the book had hers flying in the picture) to really complete the look. 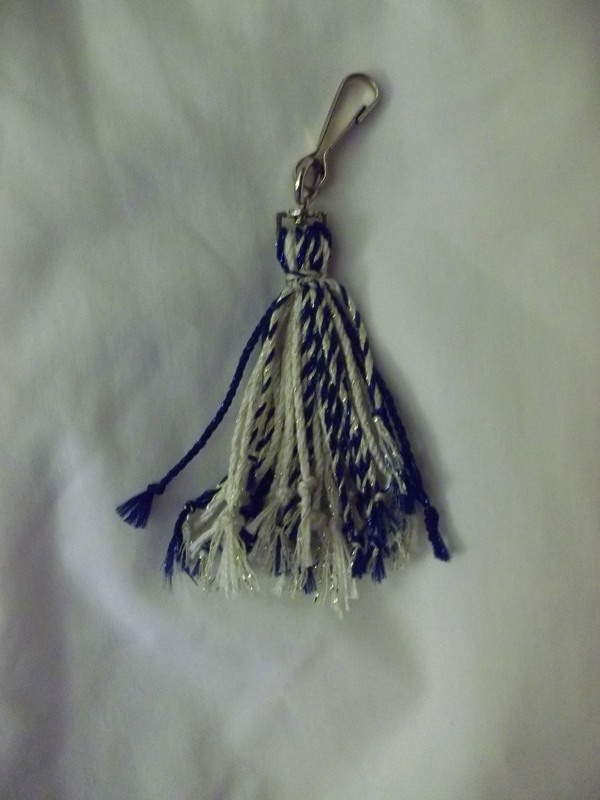 I made one extra tassel on a clip in sparkly blue and white. It did not match her colors, so the rest of her intrepid expedition will share it, with the hope of its eventual return it to me with pictures and the story of its Arctic travels. 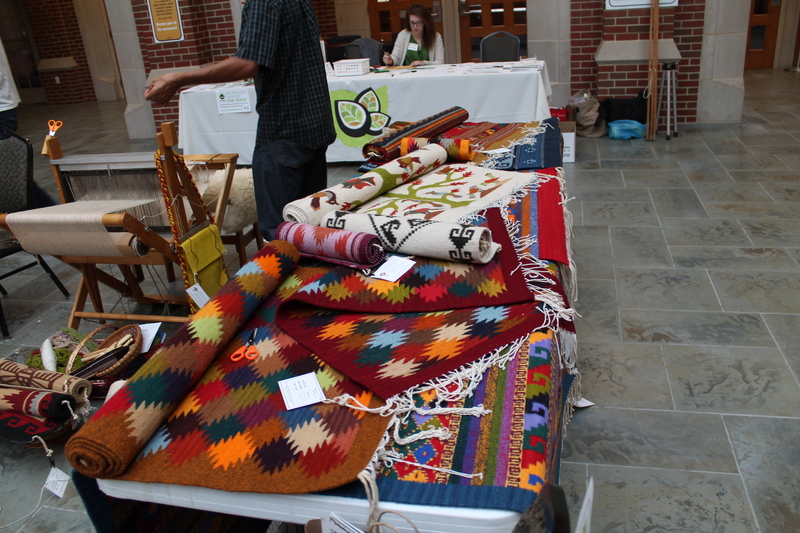 When I walked into the Free Trade Expo at John Carroll University, a few people were scattered among the dozen or so booths displaying wares, but I wasn’t looking for any of those. 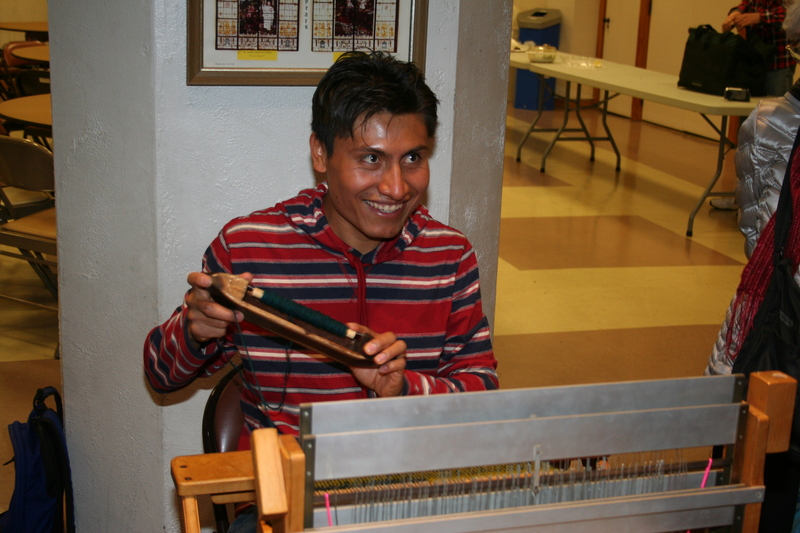 I was in search of the master weaver who hailed all the way from Tiotitlan, and I found him at the back of the room. I had been told he was young, but standing there next to Victoria’s baby Brown loom, he looked like one of my daughter’s college friends. I walked over to say hello, and introduced myself as a brand-new weaver. 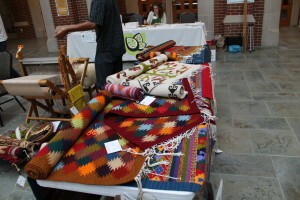 He smiled, graciously allowed me to take some photos of his rugs, and told me to come back in an hour. 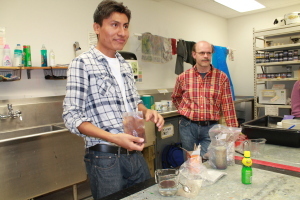 I became interested in some of the workshops and came back a couple of hours later. The empty warp had been transformed. He smiled up at me when I walked back, that shy young man transformed into a master artisan before the tool of his craft. His hands flew as he made bamboo bobbins zip between the warp threads, effortlessly creating a pattern that existed only in his head. He encouraged me to sit down and try, and patiently guided me as he told me where the color in his tapestry should change. He watched as I painstakingly threw a few picks, intent on doing no harm to the cloth he was creating. I was quick to hand the bobbin back, privileged to have been able to try his technique, and well aware that he was indeed a master. He was so genuine, so gently correcting, and so patient – and so very skilled. What an amazing encounter! 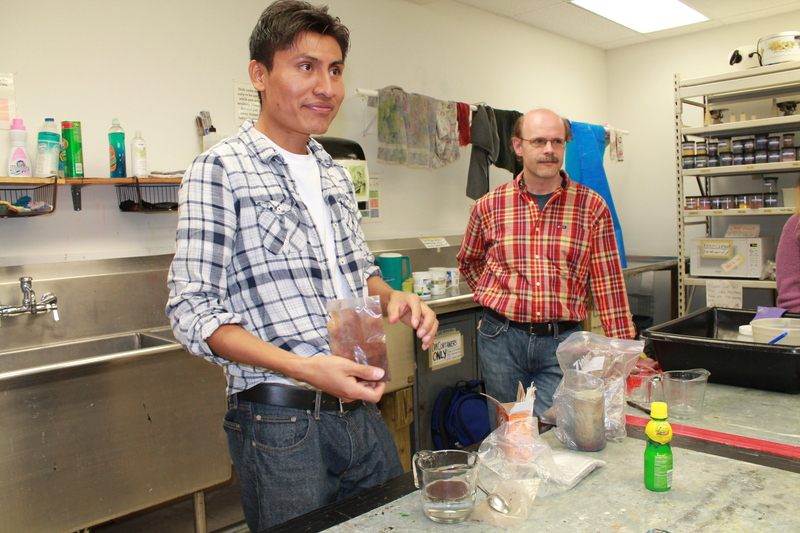 Here are some additional photos of Marcos’ visit. To stash or not to stash, that is the question. With all due apologies to Willy S., the question of acquiring a stash is always the issue. There are those who do and those who don’t. Those who don’t prefer to buy yarn only as the need arises, thereby having a clean weaving area and places to put things that don’t involve hiding them under beds or in unused suitcases. I, as you might imagine, am of the buy-as-much-yarn-as-you-can-find-room-to-store school. As I have been weaving since the 70’s, my stash is the stuff of legends. (Victoria tells me repeatedly that I am not allowed to die. That is said with love and a lot of fear.) My reason for so much yarn is that I have a fantasy that I awaken in the early dawn with a killer idea for something I want to make that can’t wait. Because of the size of my stash, I have exactly the right yarn, size, color, etc., hence the reason for the accumulation. Now in all these years, my muse has never struck early in the morning, and if she did, I would tell her to come back at a more reasonable hour. Should this ever happen, however, I am ready! 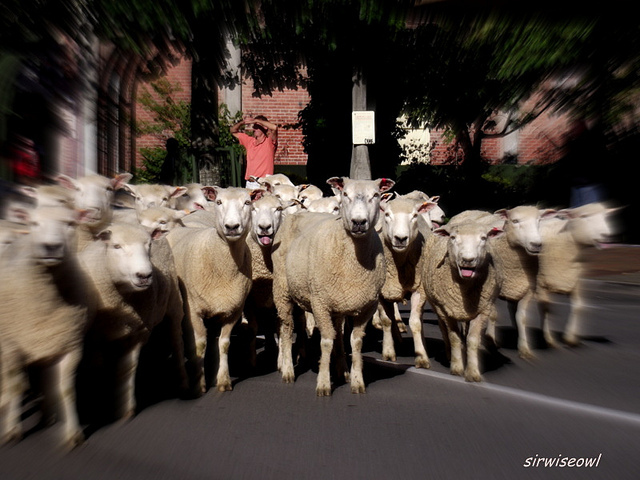 All of this musing brings me to the real reason for this article, our latest yarn sale. We have been asked by a friend and longtime guild member who is no longer weaving to sell her stash. She was a representative from the guild to Silk City Yarns. Silk City does not deal directly with the public, only through a dealer. As you might imagine, there is a lot of yarn. Silk City has all kinds of fibers and yarns and they are all first rate. While I am sure there is some silk, there is much other as well. Victoria and I moved over 20 black garbage bass and 9 boxes full of yarn. It took us two cars and two trips to get it all to my house. We have not yet seen the yarn as it was packaged before we arrived. 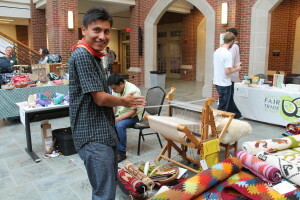 There will also be a lot of weaving books, a table top tapestry loom, a Quill penguin spinning wheel, and a Japanese braiding stand. Other things my turn up as we go through the bags and boxes. All of this and probably much more will be for sale on Saturday, May 31st from 9 am to 4 pm. After 1:30 pm I will do my usual bag for a buck on the yarn only. Get what you want early and come back to get what is left. My house is at 2980 Washington Blvd. Cleveland Hts., 44118. Telephone is 216-932-3730. Although the people who help me price the yarn do get first choice on the yarn, nothing else will be sold before the day of the sale. If there is equipment you are interested in, show up on sale day. Hope to see many of you on May 31st! Member Debbie Silver has created a web site for her fantastic tapestries and would like to share. To quote from her website: Currently, Deborah designs and weaves pieces combining tribal masks and totems with contemporary faces. Her works have been shown in juried exhibits in Chicago and NYC, and can presently be found at the Harris Stanton Gallery in Akron, Ohio. Click here to enjoy her work and study her gallery of work. 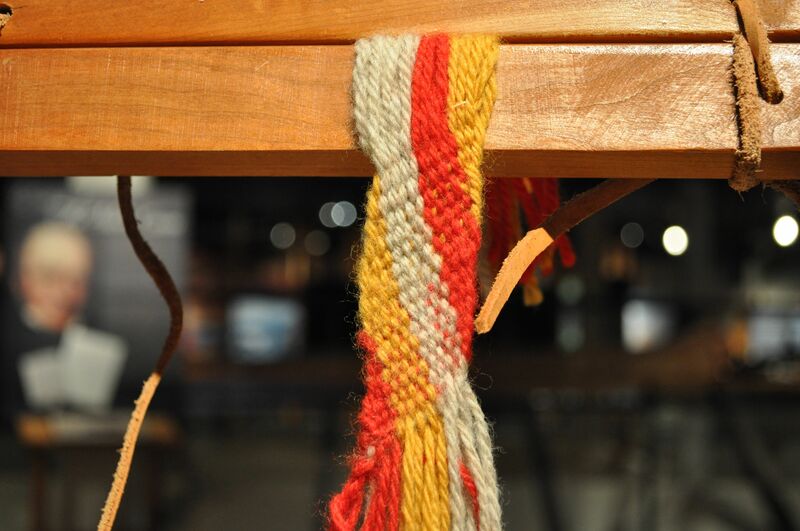 Member Nancy Curtiss attended Laura Fry’s class, The Efficient Weaver, at the recent Eastern Great Lakes Fiber Conference, and she wrote about her experience on Laura’s blog. 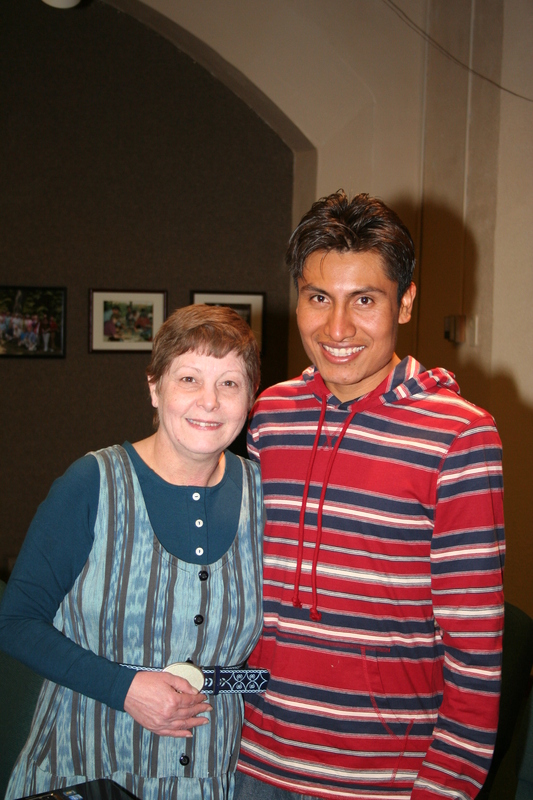 You can check out Nancy’s wonderful essay by clicking here. Old boats and weaving? Indeed! We spent a morning at the Canadian Canoe Museum in Peterborough, Ontario. It was here I was stunned by how weaving fit into the ancient history of the far northernmost parts of Canada. The traders and voyagers who used the marvelous birch bark canoes had to have vessels to store their goods in, and what did they use? Baskets. 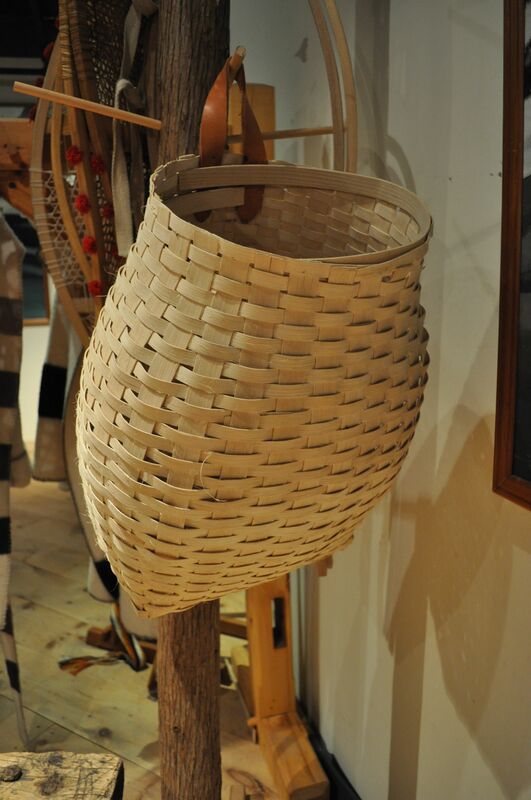 Woven baskets made of leather or strips of reeds and wood. They also had to travel on snow, and what did they use here? 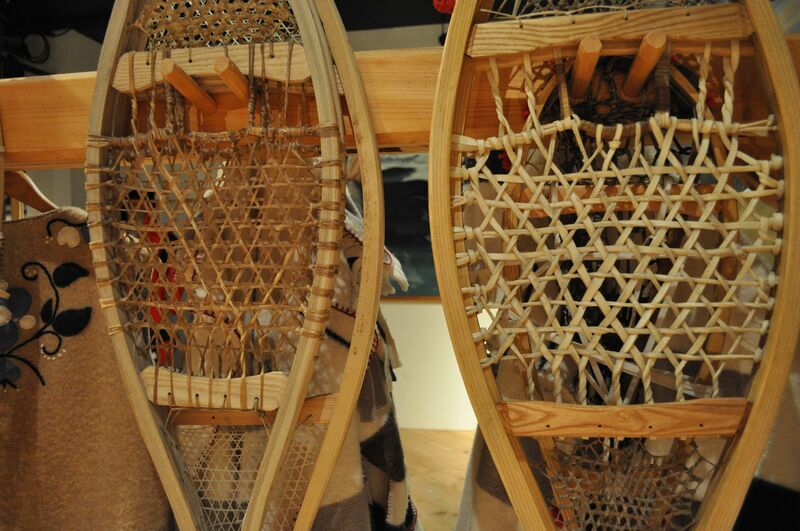 Snow shoes made of woven animal sinew stretched on wood frames. And the ever-present Hudson Bay Blankets are still stunningly efficient. But for me the most exciting was the finger weaving of sashes or ceinture fléchée. 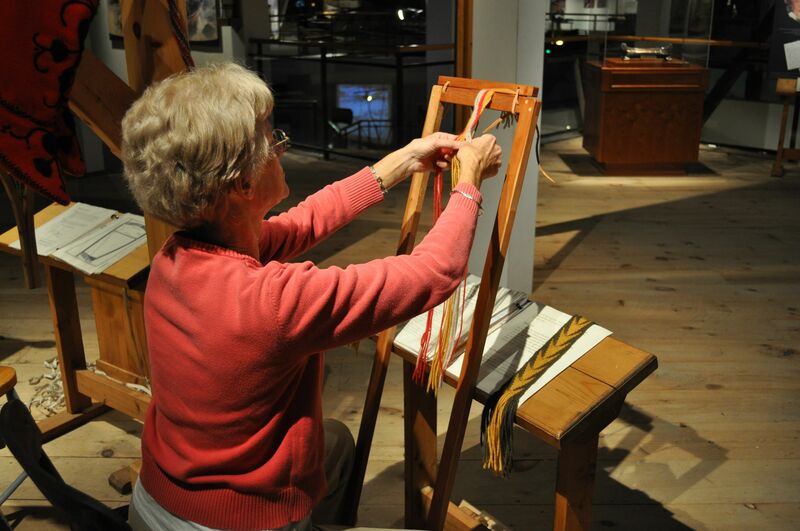 Strips of woven cloth in vivid colors and patterns attracted me to a hands-on opportunity to try it myself. And the best part? I got a book, Fingerweaving Untangled to bring home for sharing and continuing to learn about this amazing technique. Another stop displaying wonders of hand weaving in a canoe museum of all places. 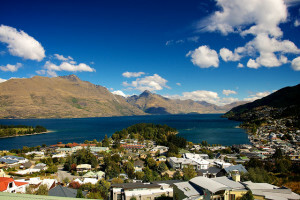 Click on any of the images below to see larger photos.